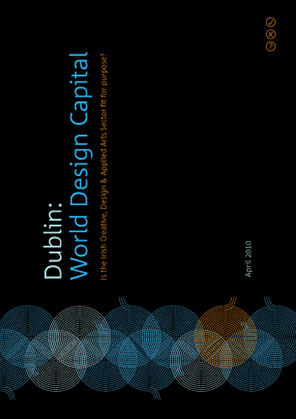 In order to identify and rectify the negative issues that have curtailed the development of a strong creative sector, some of which are outlined in this document, it is essential that a body is established that will act purposefully and swiftly to bring about positive change for the Creative Industry, will deliver advantages to the Irish Economy (particularly the Innovation/Smart Economy) and will create considerable benefits for Irish Society at large. get close to the Business Sector and take an active, central role in ‘delivering’ Innovation / building the Innovation Economy. There are many examples of stronger, more open minded and more open-to-change creative industries overseas, that make a considerable input into Innovation, Economic Development and the creation of better living conditions and systems for their Societies than is the case here in Ireland. It is essential that we, the Creative Industries, working together with the Business and Innovation Sector and the Culture & Arts Community begin the process of creating a rennaissence of the Creative Industries in Ireland. This cannot be achieved without financial input from the state. We must be relentless in our pursuit of this essential support. Such financial support is currently available to the Arts Council, The Heritage Council, the Film board, Crafts Council, the Libraries Council, the National Cultural Institutions, the Broadcasting Authority of Ireland, Culture Ireland and other bodies in Ireland and, of course, while it is the norm internationally with regard to support of the creative industries, the creative sector in Ireland is unsupported. Refresh Dublin is a community of designers & developers working to refresh the creative, technical & professional culture of New Media in Dublin. Refresh Dublin is an event that promotes design, technology, usability and standards. The intent of Refresh Dublin is to provide a cross-discipline insight into all things design, interactive, creative and technical, so that different disciplines can learn from each other. Refresh Dublin encourages collaboration, shared learning and networking within the design, interactive, web, film, gaming and creative communities in Dublin and around Ireland. The Irish Architecture Foundation’s role is to be a vibrant and passionate organisation that excites its audiences about the value of architecture. It is a focal point for the many people and organisations who wish to champion the power of architecture and urban design. The Irish Architecture Foundation co-ordinates the promotion of Irish architecture internationally. IAF produces or supports architectural events that stimulate and empower the public, research the boundaries of architecture. IAF is impartial and independent and seeks to challenge the perceptions of the built environment through public debate, events, exhibitions and this website. Established in 2005, the IAF promotes a better built environment for everyone’s benefit. The aim of The Digital Media Forum is to unify the Digital Media industry by creating cross-platform content programmes with a focus on innovation and commercial enterprise and to continually build best practice through its initiatives in training and education, with particular emphasis on enterprises that can build and maintain scale and become global players in the Digital Media industry. The Digital Media Forum is an enterprise network that develops and administers enterprise resources for companies in the digital media industry. To date the Forum has successfully administered two Skillnets Network Training calls and has raised significant funding to develop its enterprise training network on an all-island basis. Our aspiration, over the next two years, is to develop a network of 200 companies in the Digital Media area on a national basis. Enterprise Ireland is the state agency responsible for the development of Irish companies. It provides a range of supports to meet client business needs and works with clients to help them use innovation and design as an integral part of business development.